Food, dining, and restaurants are some of my favorite Disney topics. My family loves to eat. We also love to try new restaurants. It’s located at Disney’s Grand Floridian Resort in the Garden View Tea Room. I’ve heard wonderful, wonderful things about it. It has a tea party (of course! ), princess parade, storytelling, and sing-alongs. You also get to meet Princess Aurora, one of Anniston’s very favorites – mainly because she’s pink. Each little girl goes home with a My Disney Girl doll, a ribbon tiara, a silver princess link bracelet, rose, and a scrapbook “Best Friend” certificate for their new doll. If you have a boy, they also have activities and gifts for the boys! Anniston was too young last time we went and we weren’t able to get reservations this December on our next trip. I’m determined to go at some point. It’s a bit pricey, but I think it would be so much fun. Located at The Campsites at Disney’s Fort Wilderness Resort. It’s a dinner show has dancing, singing, and comedy. It has fried chicken, smoked ribs, and other yummy food. As you’ll see as you read my list, I’m a sucker for dinner shows. If they have them, I want to go. As of 2014, they do accept dining credits. For the Disney Dining Plan and Disney Deluxe Dining Plan, it takes two table service credits. For the Premium and Platinum Plans, it is one credit. Located at the Polynesian Village Resort. It’s a dinner show that contains hula dancing, fire dancing, drummers, and all other kinds of entertainment. The Disney website describes it as, “all-you-care-to-enjoy, tropical feast.” Who wouldn’t want to watch people doing all kinds of cool stuff and yummy food? As of 2014, they do accept dining credits. For the Disney Dining Plan and Disney Deluxe Dining Plan, it takes two table service credits. For the Premium and Platinum Dining Plan, it only takes one. Located at Disney’s Grand Floridian Resort & Spa. From what I understand, this is a restaurant to try without the kiddos. Maybe someday Nick and I can take an adults only trip and try it out. The menu sounds amazing. I’d even try the fish dishes. That’s saying a lot. It’s served in courses. Honestly, before I made this list, I didn’t know much about this restaurant. I added to the list because EVERYONE talks about it. Any time I read anything about Disney Dining, this restaurant always mentioned. The only Disney Dining Plan accepted here is the Disney Platinum Plan. Located at Disney’s BoardWalk. I’m not a huge seafood fan, but my family is. I’ve hear this restaurant is amazing and so I’m willing to try it. If nothing else, I know I’ll love dessert. I always do. They also serve breakfast. Located at Disney’s Beach Club Resort. It’s in the theme of a boardwalk ice cream shop. It’s adorable! They even have a jukebox. I’m sold. Good news! We have reservations to eat dessert here on our next trip. I’m so excited. What makes this special? Um, for one they sell ice cream. Other than that, they have this thing called The Kitchen Sink, eight scoops of ice cream and every topping they have. Google it. Your life will never be the same. As of 2014, they do accept dining plans (minus the Quick-Service). It is one table service credit for each plan. Located at Disney’s Animal Kingdom Lodge. This would be one that we would do sans-kid. She’s great, but I view this more as an adult restaurant. Of course I’ve never been so I could be completely wrong. It’s African cuisine (also blended with Indian and Mediterranean from what I hear) and seems to have pretty interesting dishes. It would definitely be a step outside my comfort zone, for sure, but that is one of the fun things about trying new restaurants, right?! Located at Epcot in Canada in the World Showcase. This one I didn’t pick for me. This one I picked for Nick. He absolutely loves steak. Me? Not at all. I’m weird, I know. It is what its name says it is - a steakhouse. They do have things on the menu that are not steak. Those are probably what I would order. Located at The Campsites at Disney’s Fort Wilderness Resort. An all-you-care-to-enjoy (I love how they use that phrase instead of “all-you-can-eat.”) BBQ with singing in an open-air pavilion with Disney Characters? Sign me up. We were planning to go this upcoming trip, but I wasn’t sure how warm it would be in December. Yes, I’m from Arkansas but I’m a weenie in anything below 50s. Actually below 60s. 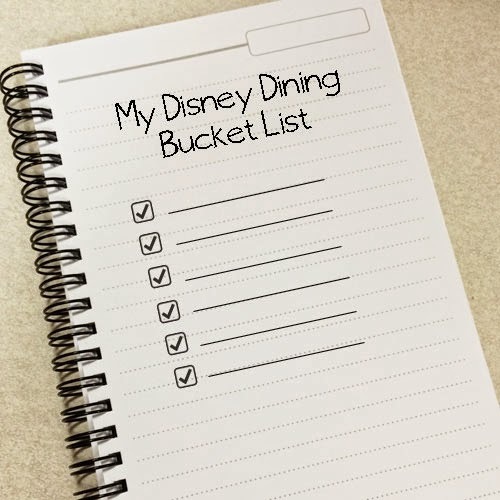 What would be on your Disney Dining Bucket List?